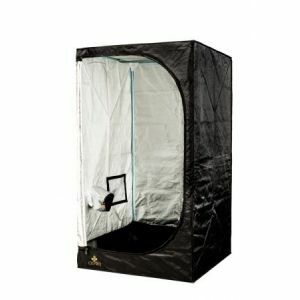 The DR90 Dark Room 2.5 from Secret Jardin is the second smallest tent in their dark room range (90cm x 90cm x 185cm). The DR90 is suitable for a 400w lighting system and would require a 100mm/4inch or 125mm/5inch extraction system. The DR90 has3 adjustable holes for extraction or air cooled lighting and 2 for cables. 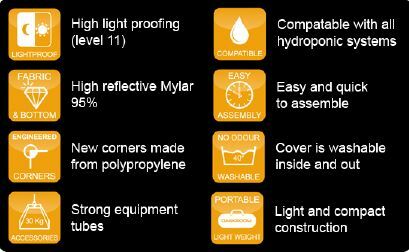 All of Secret Jardins Dark Room range benefits from sturdy contruction, highly reflective, waterproof mylar covers and excellent construction quality. Please note this is the brand new andimproved Secret Jardin dark room 2.5 range which features sturdier corner pieces and benefits from an improved multi layer mylar coated covering. RVK Fan & Rhino Hobby Filter Kit 5"
RVK Fan & Rhino Pro Filter kit 5"